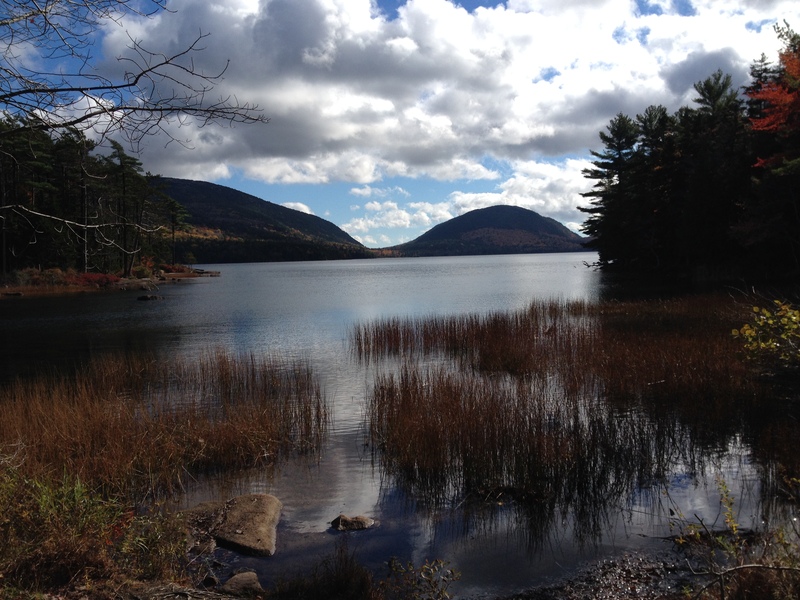 Eagle Lake – Acadia National Park…. 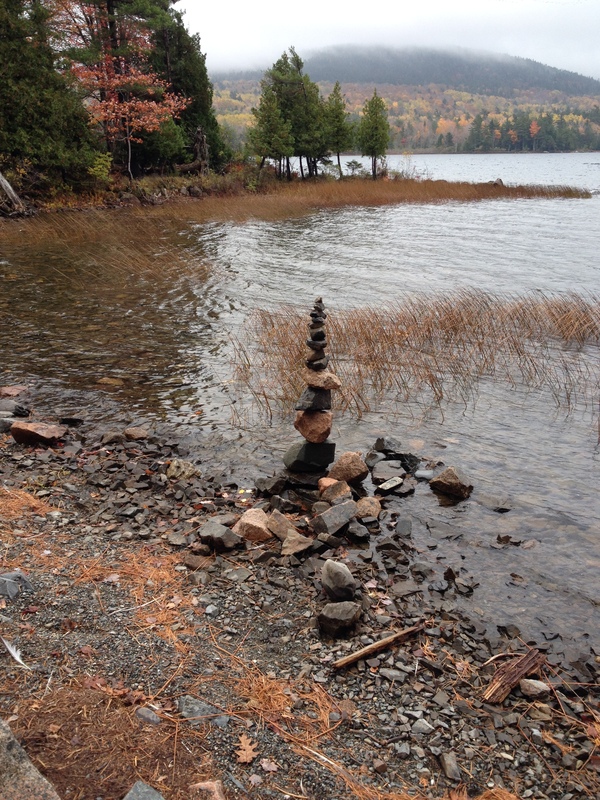 So the plan was to take a walk around Eagle Lake and then go to The Jordan Pond House for Tomato Bisque soup and Popovers. I am sure, had the day gone according to plan that I would have added a nice glass of dry white wine to that order. But the best laid plans do not always happen. 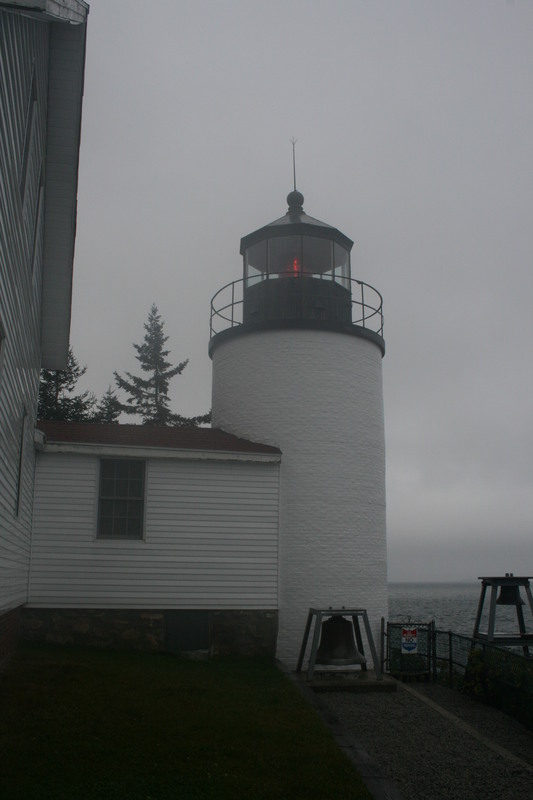 We had explored Bass Harbor Light that morning and had gone back towards Bar Harbor to park the car and start our walk. We had a little knapsack packed with water and snacks. We had our guide books so that we would not go the wrong way and walk even further than the 6.1 miles that we had planned. Chuck figured that we would be finished with the walk in about an hour and a half. I had my doubts about that – I was not going to “briskly” walk for over 6 miles. I wanted to see the beautiful scenery, take pictures of lake and the foliage. I wanted to stop and listen to the birds and the babbling brooks. I wanted to savor the entire experience. Well, I thought that it was a walk around the lake. Haha – it was an uphill walk around the lake. Of course when you go uphill you must go down hill. It turned out to be a beautiful day. The sun came out – the temps were around 58 degrees and the views were breathtaking. It took us over 2 hours to finish the walk and by the time we were finished I was a sweaty mess. I had stripped off my windbreaker/rain jacket. My very light weight polartec was tied around my waist – the sleeves on my long sleeve t-shirt were pushed up as far as they would go and my new Red Sox cap was on only to hide the mess that was my hair. Not to mention that I had a huge blister on both the bottom of my foot and my heel. It was a beautiful walk – in a beautiful place with my best friend. It was never a race, it was always a journey. 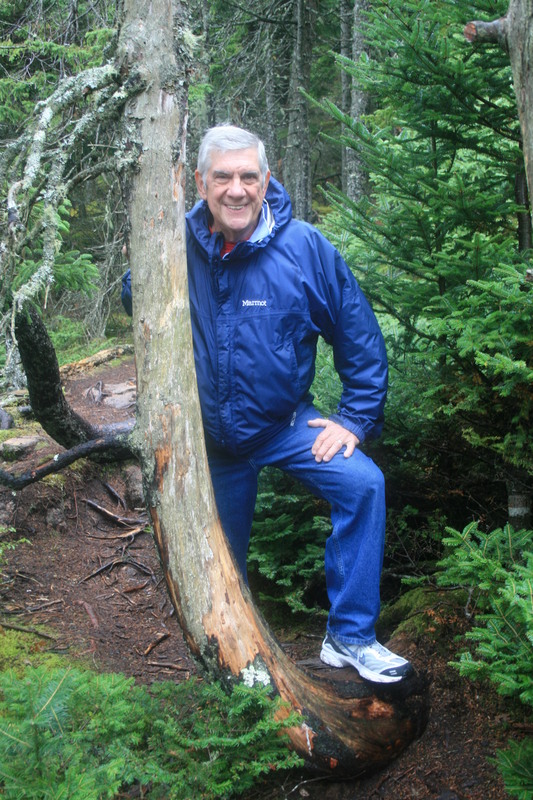 I love to walk – I have found that Maine is a beautiful place to walk. When you live by the ocean you have the advantage of seeing the ever changing seasons. The Sea looks beautiful in all seasons – but it can change from hour to hour depending upon the weather. Needless to say we did not go to the Jordan Pond House for tomato bisque, popovers and wine. I would not be seen in public. I skulked back to the car – chugged a bottle of water and we went back to our rooms. Thankfully I was a girl scout in a previous life so I was prepared and had brought cheese, crackers, salami and a bottle of both white and red wine. The white wine was chilled to perfection and the cheese and crackers tasted wonderful. We relaxed, showered and walked to dinner. The completion of a wonderful day. Thankfully the Red Sox were traveling that day so we didn’t have to struggle to stay awake to watch the game. Take a walk, enjoy where you live! In mid October Chuck and I took a couple of days off and headed Down East. Our destination was Mount Desert Island. We try to get to Bar Harbor once a year. It is one of our favorite parts of Maine. 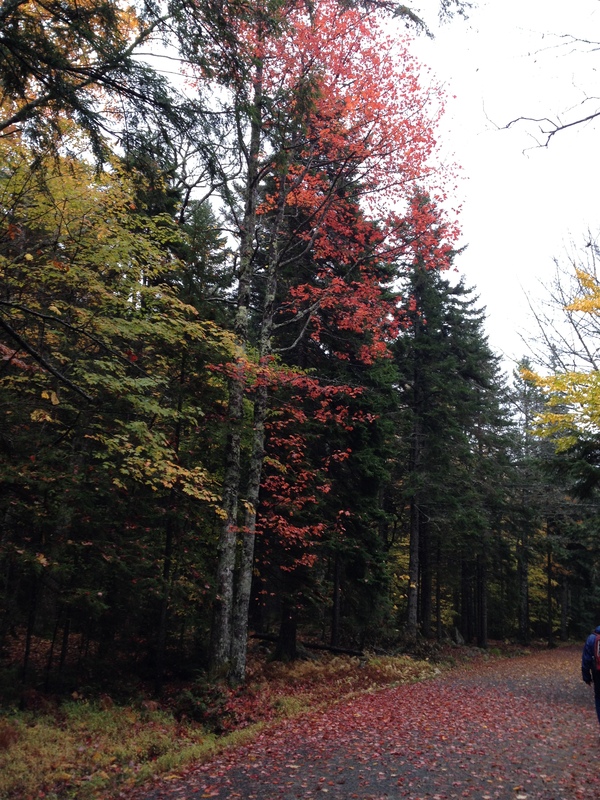 We love Acadia National Park and if you have never been there it is definitely worth the drive. It is an amazing mixture of mountains and ocean. Towering pines, crashing waves, amazing wild life and a wonderful place to relax, walk, ride a bike and see nature. On the second day that we were there the day started out rainy and dreary. Not a great day to take a long walk. We decided to take a short drive to Southwest Harbor – the most southwest corner of Mount Desert Island. 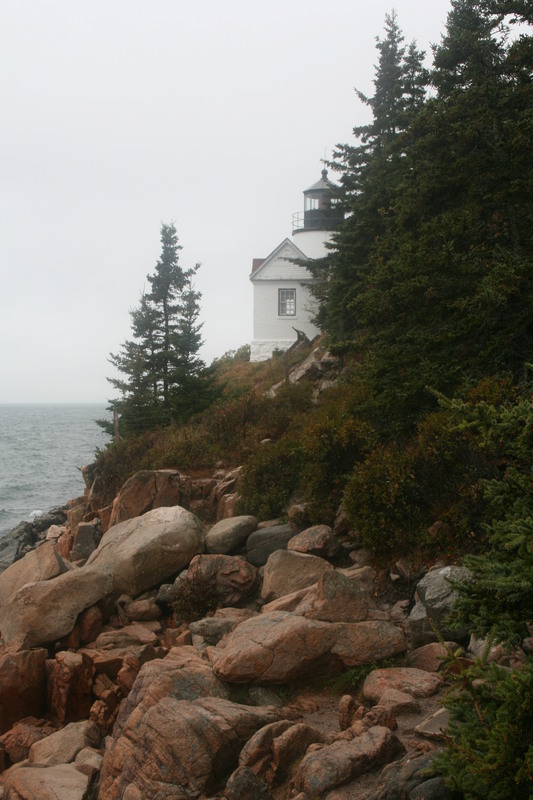 It is also the location of Bass Harbor Light. This lighthouse is perched on the very edge of the rocks. The views are amazing, even on a drizzly day. We were on the edge of the rocks looking down on the crashing waves. To the left of the Light house there is a path that brings you down through the woods to more rocks. It would have been a great place to bring a picnic. 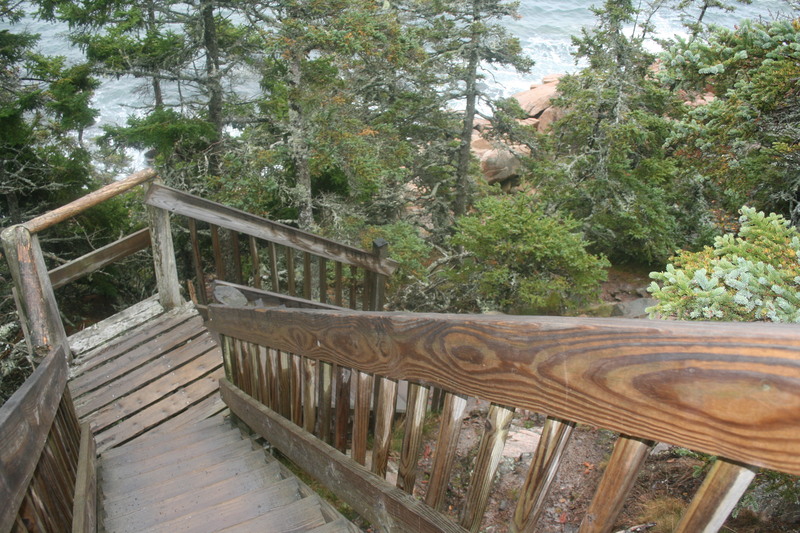 There was a very steep set of wooden steps that brought you even closer to the water. 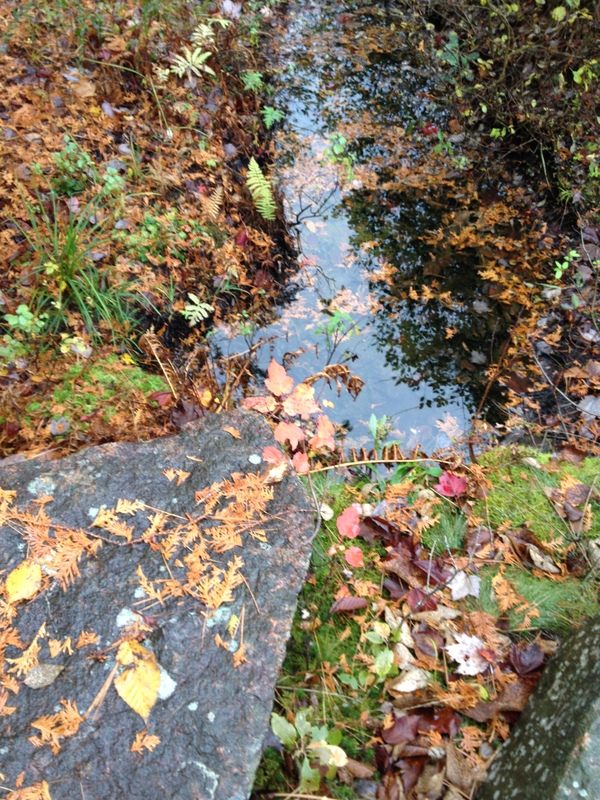 I love walking through the woods on a rainy day – it reminds me of playing in the woods behind the house with my sisters when we were kids. There is a certain scent in the piney woods that can’t be duplicated by a candle or any thing else artificial. It is a the smell of the woods – I can’t find the words to describe it, but I love it. We wandered around the lighthouse area taking pictures and talking to other visitors, then we hopped back in the car. The rain was letting up just as the weatherman had predicted. We drove through Southwest harbor – stopping at a local quilt shop to pick up a couple of yards of fabric to supplement the stash. Then on to Eagle Lake for our hike. We had our knapsack packed with some trail mix, cheese, apples and a couple of bottles of water. The hike was a 6.1 mile walk. I will write a post about that in the near future. Off to my sewing machine to work on a quilt for the veterans. Love being in front of my sewing machine! Wow – 1 year anniversary! Who would have thunk it??? I wrote my first blog post over a year ago. I have really enjoyed sharing my world with you and I hope that you have enjoyed taking a peak. 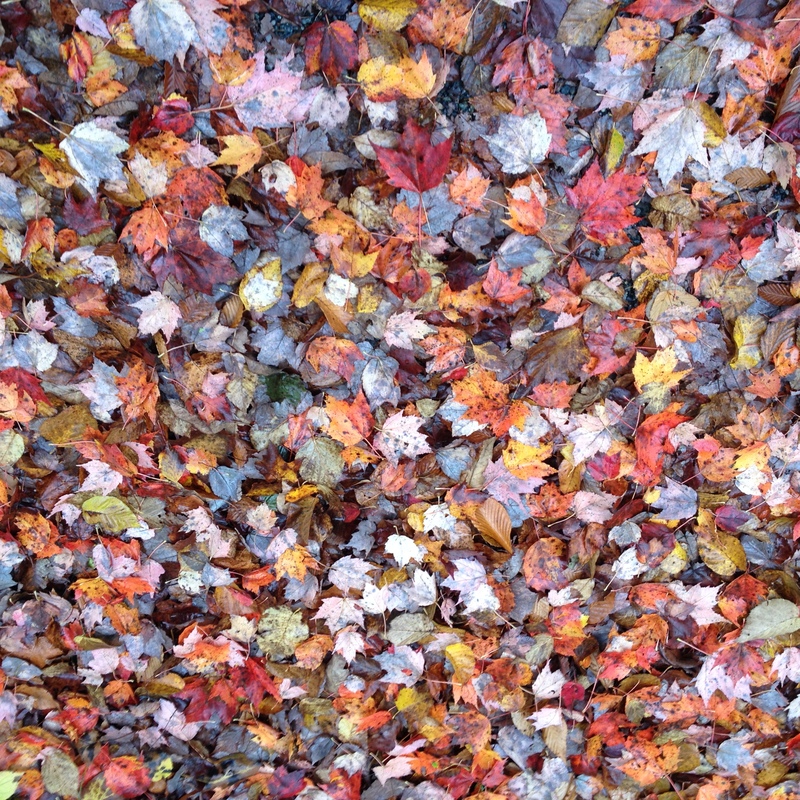 This fall has been very busy – we have done a bit of traveling, we have watched our beloved Red Sox win the World Series, I have worked on many charity projects and Chuck has removed bags and bags of leaves from the yard. Over the next couple of days I will share a lot of the wonderful pictures that I have taken and tell you about some of our adventures. In September Chuck and I celebrated our 28th wedding anniversary. Don’t ask me where those 28 years went. It is pretty nice to be married to and spend everyday with your BFF. We really enjoy each others company, we look forward to spending time together. That is a really good thing because we work together also. 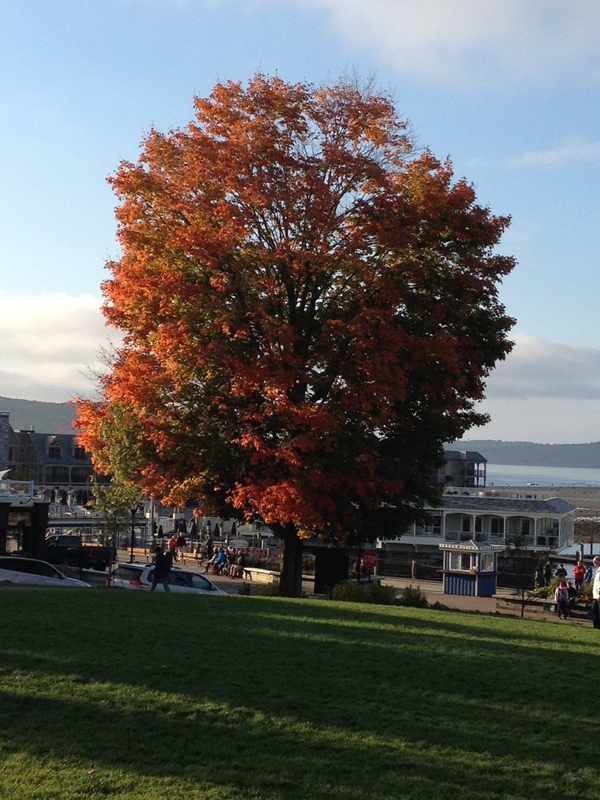 We took a trip to Bar Harbor in October. Thankfully the idiots in Washington had re-opened the Federal Government so we could walk through Acadia National Park with out “breaking” the law. I have some really pretty pictures from our walk around Eagle Lake. It was mid-October so the trees were in full color. I have been very busy being the President of Evergreen quilters. We hosted 85 quilters from all over southern Maine for a pot luck dinner and speaker. We had a wonderful meeting and handed out some fabulous door prizes. Leroy the Chicken was one of the door prizes. Leroy is a very large pin cushion. I need to make one for myself. 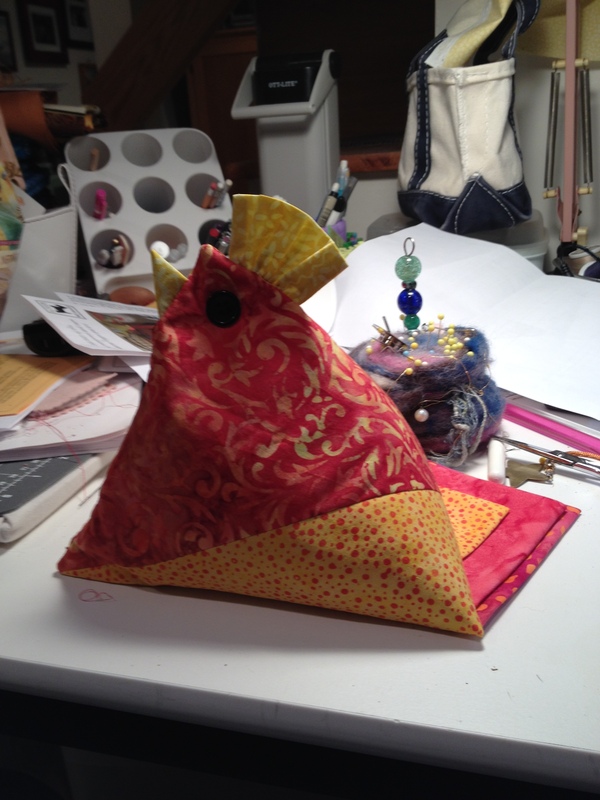 I would love to have Leroy keep me company while I sew. I would just need to keep him away from Gracie -he is stuffed with crushed walnut shells. It seems Gracie likes to eat pin cushions that are filled with crushed walnut shells. She devoured Henrietta the hen a few months ago. Bad Dog! So stay tuned – I have loads of wonderful things for you to see and read about. Thank you for taking the time to read my blog – I really enjoy the creative outlet that it gives me. I also love to share bits and pieces of my daily life here on the coast of Southern Maine.